Built with a Milwaukee<sup></sup> 4-Pole frameless motor, the M18 Compact Drill Driver delivers 500 inch lbs. of torque and up to 1,800 RPM. At only 7 1/4-inches length, this drill driver allows you access to the tightest of work spaces with total ease. An all metal gear case and 1/2-inch metal chuck provide maximum durability, even on the most challenging worksites while REDLINK Intelligence provides advanced protection in abusive situations and manages the tool's temperature to provide maximum life. The REDLITHIUM battery pack delivers more work per charge and more work over pack life than the competitors. 5-Year Limited Warranty and 2 year battery warranty. For more information please contact 1-800-628-0525. The BLACK+DECKER BDCDD12C 12V MAX Lithium Drill is 35% more compact then the 12V GCO1200C, which allows you easier access into tight spaces. It features a soft grip handle which provides added comfort during use, a variable speed trigger for better user control, along with an LED work light that illuminates the surface for easier drilling in dark places. This drill includes a 12V MAX Lithium Ion Battery - Always ready, holds a charge up to 18 months. Common uses include; drilling through wood, plastic & metal, Hanging pictures, towel racks, etc., Tightening up loose screws, Assembling furniture and/or kids toys. Includes: (1) 12V MAX Battery, (1) Charger, (1) Double Ended Bit. Brushless FEIN PowerDrive motor with 30% greater efficiency and longer service life. QuickIN accessory interface for all QuickIN accessories and fast changes between applications. 2-speed solid metal gearbox for drilling in metal and self-drilling screws.Includes QuickIN solid metal drill chuck (120 Nm) with carbide jaws and high clamping force. 750 screw connections (5x40 mm) with one battery charge (2.5Ah). 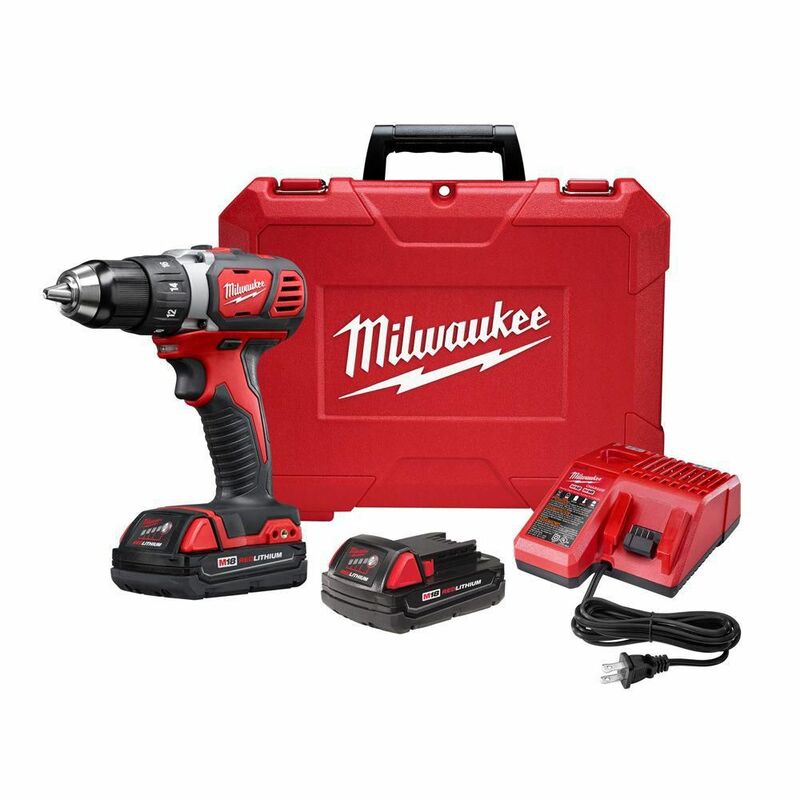 M18 18V Lithium-Ion Cordless 1/2-Inch Drill Driver Kit with (2) 1.5Ah Batteries and Hard Case Built with a Milwaukee<sup></sup> 4-Pole frameless motor, the M18 Compact Drill Driver delivers 500 inch lbs. of torque and up to 1,800 RPM. At only 7 1/4-inches length, this drill driver allows you access to the tightest of work spaces with total ease. An all metal gear case and 1/2-inch metal chuck provide maximum durability, even on the most challenging worksites while REDLINK Intelligence provides advanced protection in abusive situations and manages the tool's temperature to provide maximum life. The REDLITHIUM battery pack delivers more work per charge and more work over pack life than the competitors. M18 18V Lithium-Ion Cordless 1/2-Inch Drill Driver Kit with (2) 1.5Ah Batteries and Hard Case is rated 4.4 out of 5 by 332. Rated 5 out of 5 by Sheree from Great drill! ... Great drill! Rated 1 out of 5 by Bronco from Dead out of the box. Neither battery would charge, likely due to a bad charger. Tried everything.... Dead out of the box. Neither battery would charge, likely due to a bad charger. Tried everything. Returned for refund and bought a more expensive DeWalt instead. Return/refund was hassle free. Rated 5 out of 5 by PrecisionAG from Just what I needed! ... Just what I needed! Rated 4 out of 5 by HomeDepotCustomer from I appreciate Milwaukee tools and use them regularly. I have... I appreciate Milwaukee tools and use them regularly. I have never been a fan of battery tools, however, I must admit, they hold up and get the job done. And, they last. Compared to lesser cost models, on the job, I change my battery less often than other workers do. It might be well worth noting, the I retired last year, and have little use of my tools now on a daily basis. But, when it came to buying something I needed, I saw that the Milwaukee was on sale, and I got it. Of course, I could have spent a lot less, but being confident when I do need it is important. Thank You.